It’s somehow only Thursday. Seems impossible to me at this point, but we’ve still got two full days until the weekend. I’ve been at home most of the week, taking care of a sweet, sick baby and I’m simultaneously ready for the weekend and also very ready to head into a work week to spend just a few hours by myself. I love being a mom more than anything else, but, um, I also need a break sometimes. Is this the kind of thing that’s OK to whisper out loud? Mom love is a funny love. I’m dying for a few minutes by myself and then an hour into the workday away from him and I find myself scrolling through my phone photos because I miss him so much. Sigh. Pretty sure this is going to be my new normal for forever. I read a thing this week about people complaining that bloggers ramble/write to much before they get to the actual recipe. OK. Tell me- what are your thoughts on this? I might not be the most interesting food blogger out there (by a long shot), but this is also my space. I’m not a recipe robot machine and personally, I like things that are well- personable! My fellow bloggers, please keep telling your stories. For those who don’t enjoy them, your scroll finger should get you to where you need to go in just a few seconds. I don’t have too much to tell you about this recipe other than it’s a.) deliciously bomb and b.) made in a slow-cooker and c.) indian food! We all love Indian food and that makes me so incredibly happy. You all love my slow cooker butter chickpeas, coconut curry, saag paneer, biryani, vegan korma and chana masala. So I did it again for you! 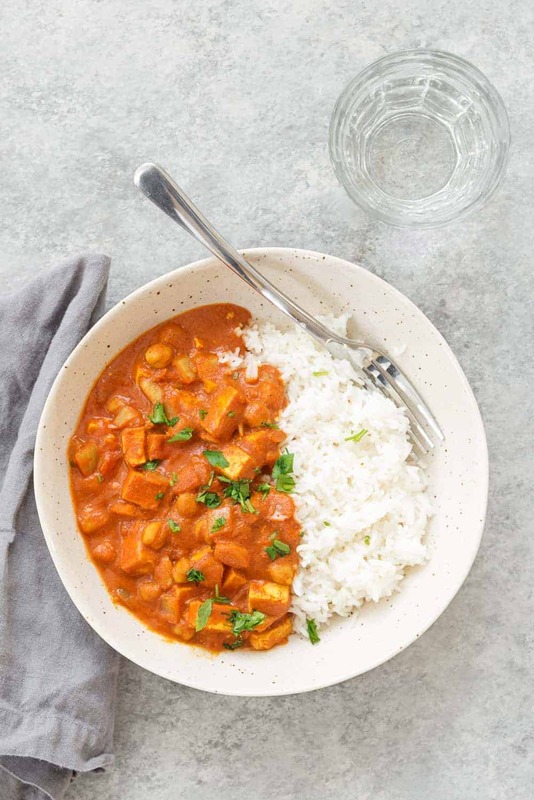 Chickpeas and tofu into a warm and comforting tikka masala sauce. It’s like a giant hug in food form, something it seems we could all use a little more of. I personally love your writing at the beginning of your posts…but can we talk about podcasts for a second? Most of them are the ones who really need that advice! Too much advertising and chatter at the beginning then 10-15 minutes later the show finally starts! I hope you all will continue writing your posts with stories and comments. In general I have learned a lot from your blog because like you, I am primarily vegetarian and am trying to incorporate more vegan meals into my day. I appreciate that you have begun to include more vegan recipes in your posts. I have had some bad experience with tofu but maybe I should revisit and this recipe looks like a winner. And thanks again for teaching me about tempeh!! HI Alex! I’m not kidding when I say that my mouth started watering the moment I saw this recipe. It’s printing out now and I will make it this Sunday, as it’s my day to cook! Please keep letting us see the person behind the magic curtain of wonderful, nutritious, conscious recipes. You write in a charming and warm manner, much like your site, and it’s a nice break from all the hard news we get in our feeds and emails. I think part of the way we can all “pay” for your immense generosity in sharing your knowledge with us is by being a receptive and supportive audience for your real life as a business woman, wife, and mother. I enjoy your posts, please keep them coming! Thanks Patricia! Please let me know what you think of the recipe! And, thank you for your kind words and feedback. I appreciate it! Can’t wait to try this dish out. I recently transitioned to veganism & I’m trying to get myself to like tofu. 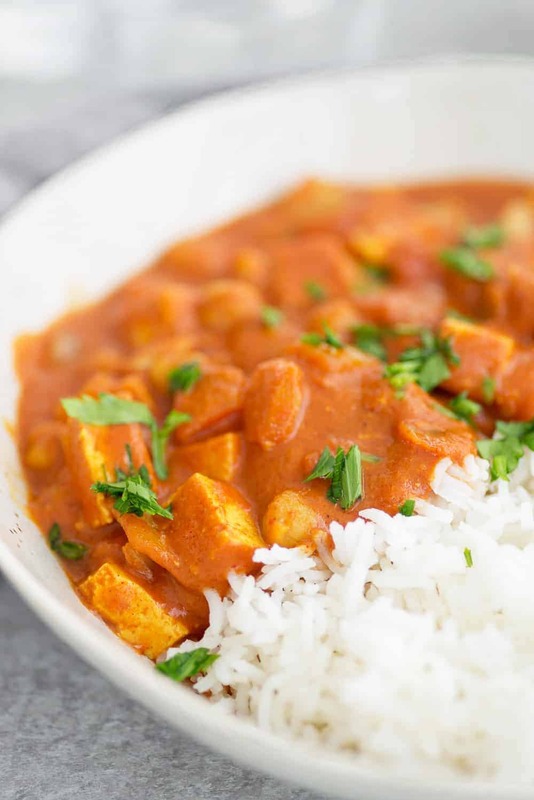 I love curry, so I’m sure smothering tofu in a rich & spicy tomato sauce will help! We LOVE curry too! 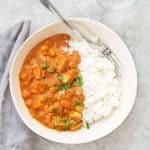 I’ve got quite a few vegan indian dishes on this site! This recipe was so easy and delicious! Yaas! 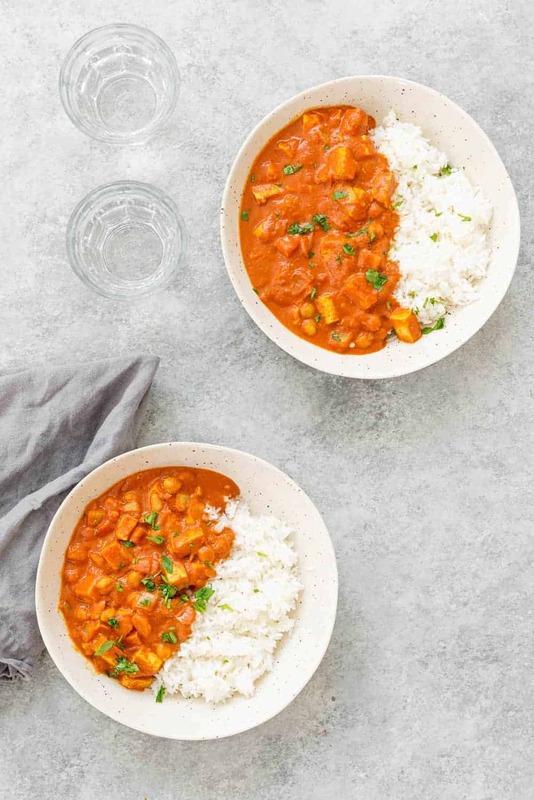 I’ve been on an Indian kick lately and this is easy and delicious. My kids loved it. Has anyone tried this with light coconut milk? Thank you! This recipe was absolutely delicious. My family loves it and the light coconut milk was perfect.